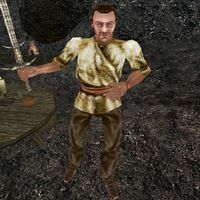 Seliulus Laenius is a hostile Imperial agent located inside the cave of Nammu. He is a medium trainer in Speechcraft and Light Armor, and a minor trainer in Sneak, if you can manage to speak to him. He wears a common shirt with matching pants and shoes. He also carries a leveled short blade, a leveled potion and up to 20 gold. Aside from his natural charm and ability to absorb fatigue from others, he knows no spells. Ring in Darkness: Find this legendary ring in the caverns of Nammu. This page was last modified on 11 March 2019, at 17:35.